Vienna is perfect for city walks. 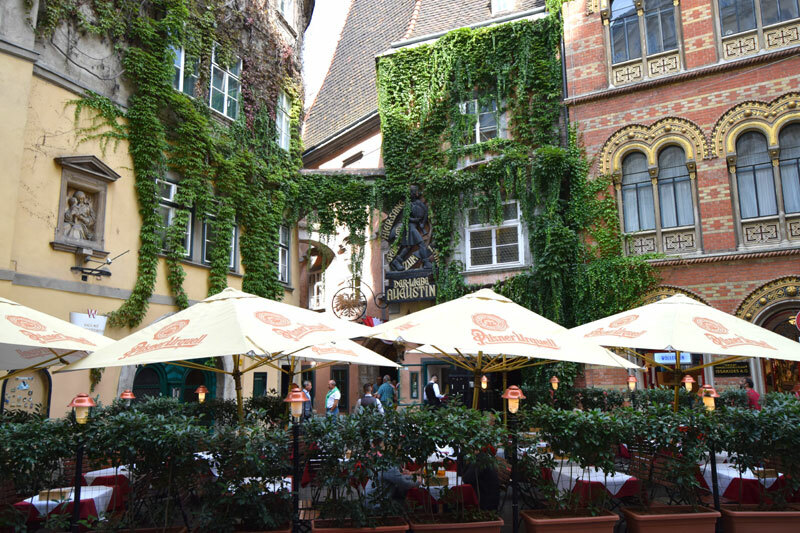 We stroll from Schwedenplatz to Stadtpark and get a glimpse of Vienna’s long history. Along the way, we’ll also get a taste of the Viennese culinary heritage. Innere Stadt, the Vienna historic city centre within Ringstrasse is a delightful place to discover on foot. Here you find everything from narrow alleys, picturesque houses and small idyllic squares to majestic palaces, sumptuous cathedrals and beautiful parks. The first of our Vienna city walks take us from Schwedenplatz to Stadtpark. We start at the traffic junction Schwedenplatz, where several bus, tram and subway lines meet. A bustling street life meets us as we get off the tram on Schwedenplatz. 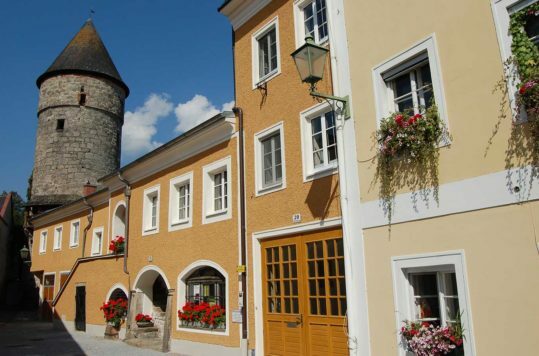 The square got its name after World War I, acknowledging the help Sweden gave the new Austrian Republic. 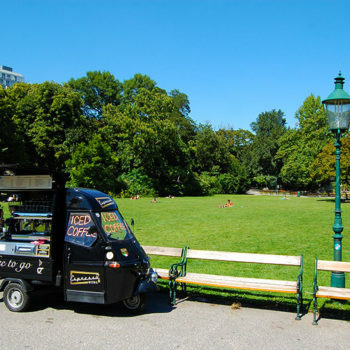 While someone hurries in and out of trams and buses, others relax and enjoy something good to eat at one of the many outdoor restaurants or take a quick snack at one of the traditional Viennese hot dog venders. Nonetheless, we will not give in to the temptation for a bratwurst and head off to find Hafnersteig. The little cul-de-sac got its name from the stove-makers, who lived and worked here in the Middle Ages. 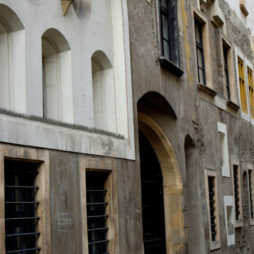 After a treading few steps we have reached the so-called “Greek quarter” and Griechengasse. 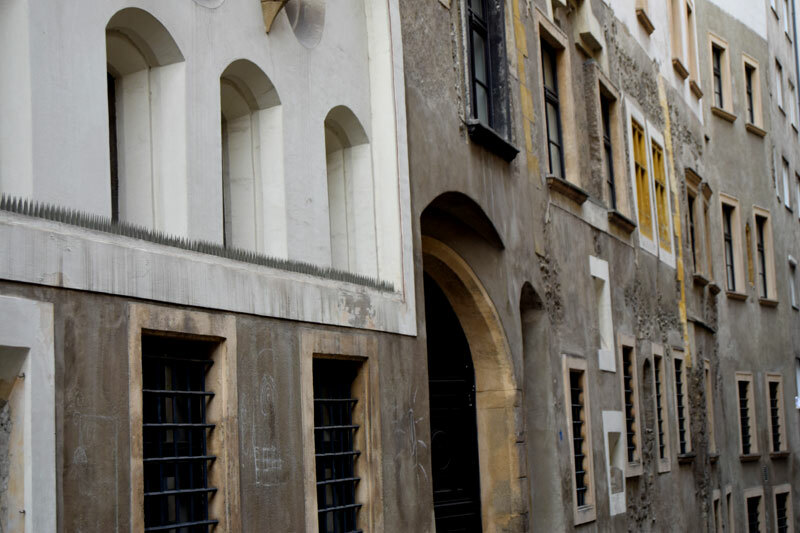 One of the most peculiar houses in Vienna hasa to be Griechengasse (No. 4), built in the 1400s. The disorganised facade is both weird and fascinating. Especially, since in Vienna, you are used to seeing beautiful classic symmetrical facades. However, countless renovations over for hundreds of years, has left a patchwork of styles and nothing seems to be on the same level. The reason why this little piece of Vienna is called the “Greek Quarter”, is the result of a peace treaty following one of the many wars, that allowed Greeks living in the Ottoman Empire to settle in Vienna. Greek merchants from the Levant gathered in some small streets in this part of Vienna, and hence the “Greek quarter” or Griechenvirtel in German. 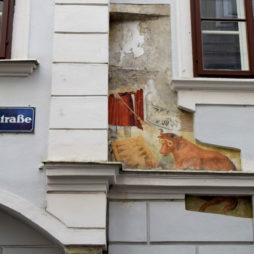 We continue our walk up through the little alley (see the main picture above) and pass the Griechenbeisl (Greek Inn), which is Vienna’s oldest restaurant. Despite several name changes since its inauguration in 1447, the eatery has always served dishes from the local cuisine. Absolutely amazing to think that food has been served continuously in these premises for 570 years!!! The beautiful brick building next to the restaurant sticks out among its neighbouring buildings. The Greek Orthodox Church (Griechenkirche zur Heiligen Dreifaltigkeit) has been there since 1787. We move in with our city walk and turn right (with the church behind us) and continue 50 metres beyond Fleischmarkt and turn left into Köllnerhofgasse. After about 100 metres we reach the small square Lugeck. I’m sure the vast majority of people sitting and eating at the outdoor restaurant are not aware that in 1529 there were gallows here, used to hang thieves. From the 1200s to 1700s the square was dominated by a meat market. 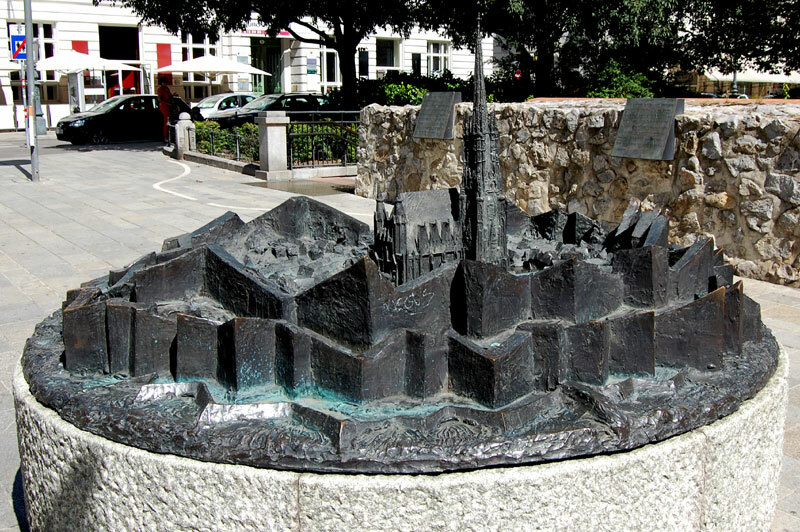 In stark contrast to the sinister gallows of the 16th century, a statue of Johannes Gutenberg was placed here in 1900. After taking a minute admiring the father of the invention of the movable-type printing press, together with the beautiful façade behind him, we continue around the corner and into Bäckerstraße. At this point a little break seems right and maybe something to eat. At Bäckerstraße 9 you find a good old-fashioned café, the Kaffee Alt Wien. 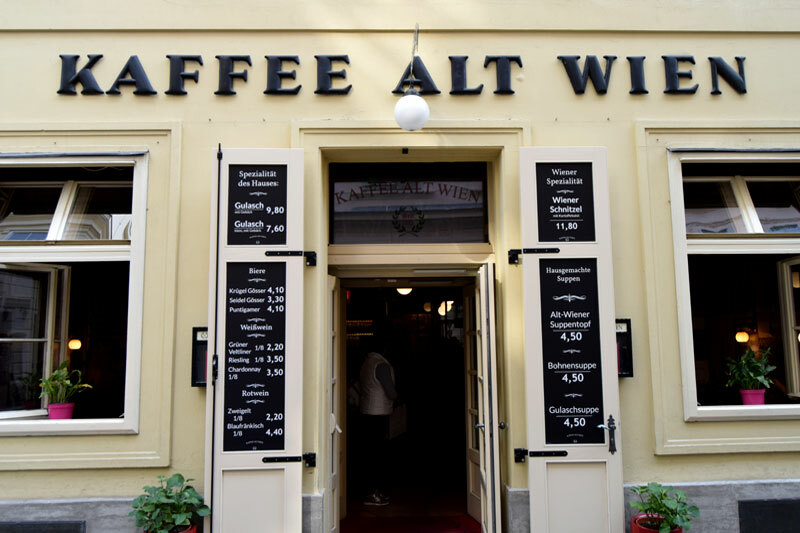 The Austrians love soup, and so do we and always stop at the Alt Wien, whenever we are in town for an Alt-Wiener Suppentopf. Do not be fooled by the slightly shabby interior of Kaffee Alt Wien, with red plush sofas, brown armchairs and faded theatre posters. The food is good and the service typical Viennese. 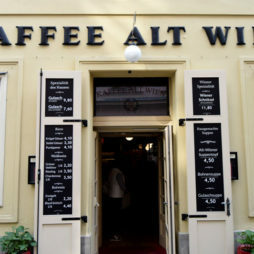 Although one and other tourist find their way through the smoky café right inside the door, or in the non-smoking restaurant at the back, you will mostly hear Viennese spoken. After the tasty soup is consumed, we take our camera and street map and head back out onto Vienna’s streets. We turn left and continue a few meters along Bäckerstraße, reaching number 12 for another curiosity. Although, we have passed by it several times before, we finally noticed it. 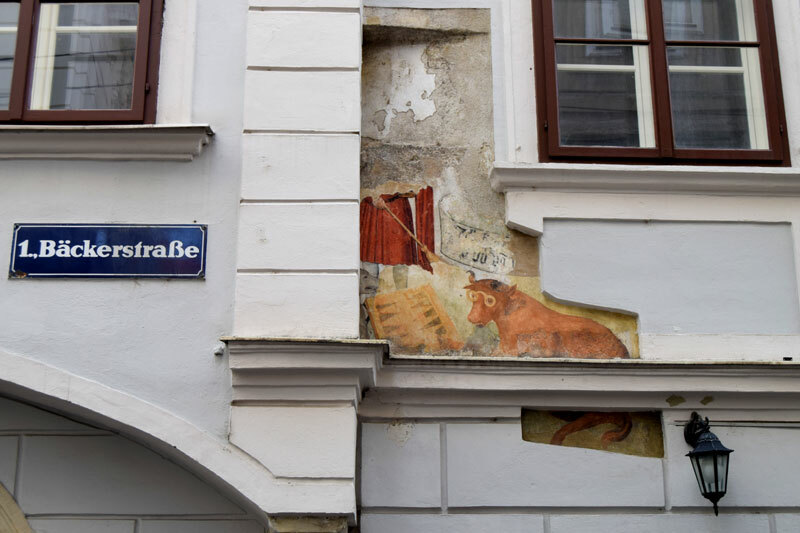 A brilliant fresco from the 1700s on the facade, showing a Backgammon playing cow. The fresco on the building from the 1400s, reappeared during a refurbishment in early 1980s and was preserved for posterity. Furthermore, if you fancy seeing some really amazing frescoes, you do not have to venture far. 50 meters beyond the backgammon playing cow, the street opens to a small square, and the baroque facade of Jesuit church reveals itself on the left. The exterior of the church in no way gives any hint of what is waiting for you inside. 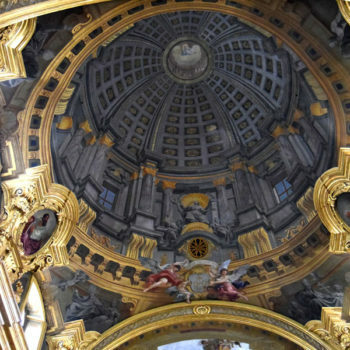 We have visited a number of churches and cathedrals in Austria, but the decoration in the Jesuit church are nothing less than spectacular works of art. 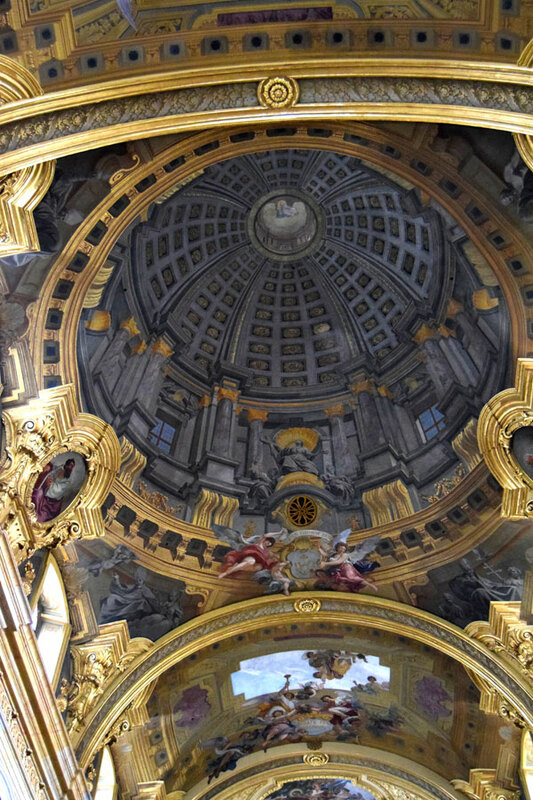 Just sit down, look up and savour the ceiling frescos. After enjoying the amazing art-work in silence, we leave the church crossing the square, turning left and strolling further down the Bäckerstraße. If you catch the scent of wisdom, you’re right. Because when you pass under the arches, you are passing through the old university of Vienna (Alte Universität). Students have soaked up wisdom and knowledge her since the first school was built in 1237. Nevertheless, we have to retrieve our wisdom on the streets of Vienna and continue through the next building. Along the way we pass the Spanish restaurant TintoRosso and enter Dr. Karl Lueger Platz and Stubentor. Much of today’s central Vienna derives from the major redevelopments of the mid-1800s. Before the redevelopment, the city centre of Vienna was within a large city wall. One of the few visible remains is, among others, is the Stubentor (city gate). Yet it’s hard to imagine what it used to look like. 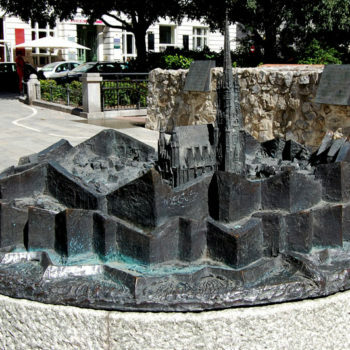 Thus, the city model on the sidewalk gives you a good idea how Vienna used to look like. After spending a few minutes orientating ourselves in the medieval Vienna and snapping some pictures of the remains of the city gate, it’s time to our sightseeing. 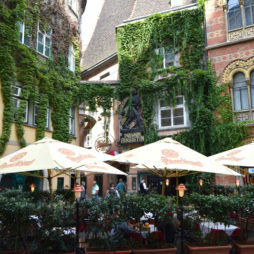 We continue outside what used to be the old city walls and cross the Ringstrasse (Parkring) and head into the greenery. 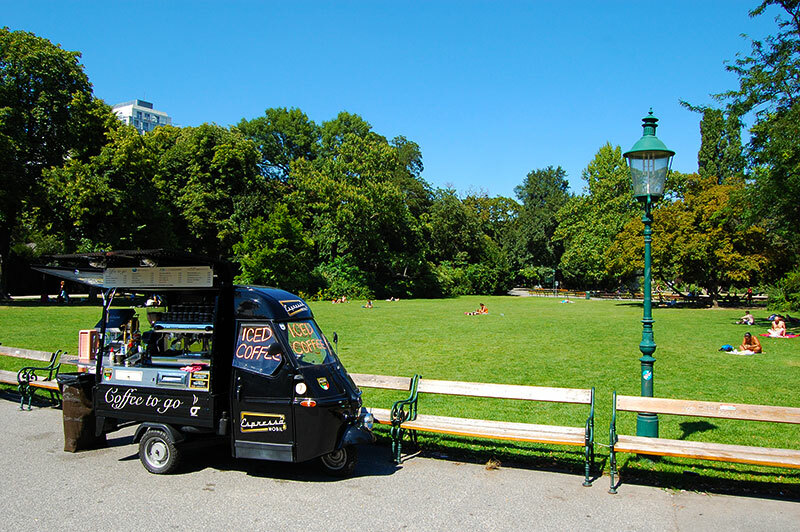 Stadtpark (city park) is a magnificent and popular park. In the summer weekends, the park is packed with Viennese who relax and enjoy life, while tourists crowd around Johan Strauss Denkmal. The memorial of the famous composer and king of the waltz is one of Vienna’s most photographed sights. You will also notice the river in the middle of the park. This is not a side arm to the Danube, but the river Vienna. The 34 km long river has its origins in the Wienerwald. After picking up a couple of cappuccinos from a mobile coffee shop, we find a quiet place by the pond in the middle of the park. Here we bask for a while in the sun, as we plan the next walk in lovely Vienna. We hope you enjoyed our small but interesting stroll from Schwedenplatz to Stadtpark. We will present more Vienna City Walks, so tune in later! For more info, check out Vienna’s official tourist office.